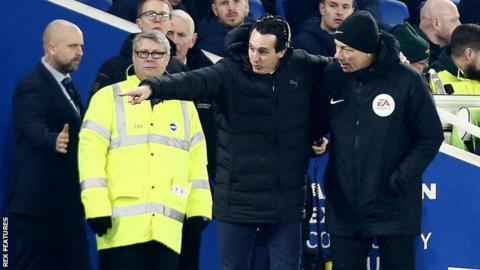 Arsenal manager Unai Emery has been fined £8,000 by the Football Association for kicking a bottle which hit a Brighton fan during last week’s Premier League match between the sides. The Spaniard apologised for the incident, which was not included in the officials’ match report. “I said to them I’m sorry,” Emery said after the game. An FA spokesperson said Emery had “accepted the standard penalty”. “I kicked the bottle in frustration but not at the supporters, not with this intention. It’s circumstances. I apologised. I hope it’s the end of the matter, yes,” he said. Former Manchester United manager Jose Mourinho was given a one-match ban after being sent off for kicking a water bottle down the touchline during his side’s Premier League game against West Ham in 2016.